Boston is wonderful place if you are interested in architecture. There are so many glorious historical buildings. America's gilded age brought architecture with unparalleled opulence to Boston. Some of these buildings still remain untouched. Such is the case with the beautiful English Rose Estate, built in 1929. The house was built for Quincy Adams Shaw, a wealthy copper mining investor. The house is a three story, symmetrical red brick Georgian Revival almost 18,000 square feet. When the homeowners purchased this elegant estate it was in dire need of renovation. They looked toward the talented architectural talents of Meyer & Meyer . Both John Meyer and Laura Brooks Meyer became instrumental parts of the elite design team to restore the home to its original grandeur. 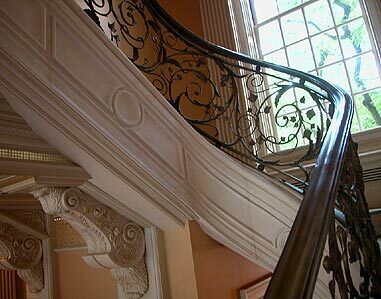 The scope of the work included the complete interior rebuilding of two-thirds of the house to create a new master suite, third floor bedroom suite, new entry and reception halls, and construction of a new main stairway. With Meyer & Meyer directing the efforts no detail was overlooked. A new limestone portico was also added on the west elevation of the house with a balustrade railing at the second floor terrace. Now let's have a look inside. Here is the original stairway when Meyer & Meyer began their renovation process. The goal was to not only return the home to its original beauty, but also to enhance it. John Meyer is also an artist. He creates expressive, hand-drawn perspective images of his designs. Meyer feels his drawings provide a “virtual window” where architectural and interior design issues unfold before the owners eyes and allow every detail to be studied. As he designed this home, these hand renderings gave his clients an clear picture of his vision and feel for the space. Often times his clients frame these spectacular works and they become treasured and sentimental parts of their art collections. Above is Meyer's hand rendering of the entry staircase. Isn't it spectacular?! Here is the final result. You can see that the style of the interiors evolved over time because the homeowner, who travels extensively in Europe, was enamoured with the chateaus outside of Paris. The interior result decidedly became more French than American with the use of French rococo style, pastel colors and detailing. Notice the addition of the window behind the staircase, this small window adds an incredible amount of natural light to the space. Also notice the new hand forged bronze railing - a true work of art. Meyer did an amazing job of capturing all the details and creating a space of reminiscent of a bygone era. Here is the before picture of the Grand Reception Hall. And here is the hand drawn rendering that Meyer carefully and thoughtfully prepared for homeowners. Finally here is the end result that was guided by both John and Laura Meyer. How could you not be awestruck?! 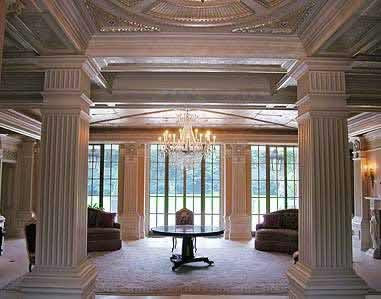 Notice the moulding details, as well as the hand painted ceilings. These spectacular ceilings were painted by John Canning, the conservation specialist that also was responsible for restoring the sky mural on the ceiling of New York's Grand Central Station. Every craftsman on this project was dedicated to maintaining the highest level of quality and integrity. An amazing result! Here is yet another view of this gorgeous home. The detailing is outstanding. The Grand Reception hall from another angle - notice the ceiling detail, crystal chandelier and fireplace. The master bath, bedroom and dressing room were also part of this renovation. The panels of master bedroom were also painted by Canning. Each of the four panels depicts a woman enjoying each of the four seasons. A peek into the dressing room. Notice the cove lighting, moulding detail and hardware. No detail was overlooked. It is wonderful to see these old buildings being carefully restored and returned to their original grandeur. The English Rose Estate is a reminder to us all the value of preserving and enhancing historical properties. To read the article from New England Home and to see more gorgeous photos and details about this house click here . For more information about the beautiful work being done by Meyer & Meyer click here. Thank you again to Meyer & Meyer for sharing this spectacular, lovingly restored architectural gem with us.